Hey! I can’t believe I haven’t made a post since October! I have been busy crafting away but have been totally neglecting my blog. I had an amazing Christmas, I was spoiled beyond! (and I loved it) LOL!! I spent most of November and December toying around with making some jewelry and I will be posting some pic’s here to share with those of you who are interested, but of course, I will continue with my cards and paper crafting as well! 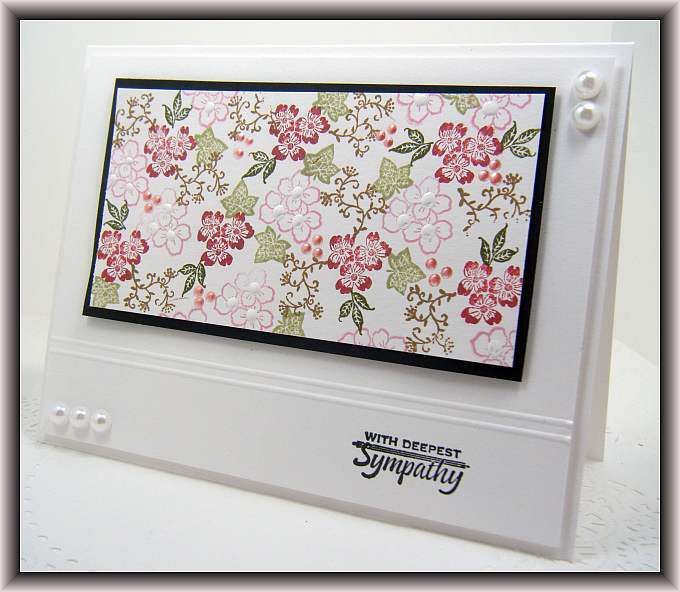 Here’s a lovely Sympathy card I made last night using a couple of Rubber Stamp Tapestry peg stamp sets I have…. I love that you can mix up these sets, they all seem to go so well together! I hope you all had a fantastic Christmas!! ← Morning Lilies Peg Stamps…. YAY!!! I’m glad to see you are back – I have missed your posts… I’m glad you had a good Christmas – it is good to be spoiled! Your Sympathy Card is very nice. I like the color combination you used for the flowers. Welcome back Lisa. It’s great to see you again! I love it, Lisa, so elegant. Beautiful job. Wishes for the Happiest and Best New Year Ever. We all are happy to see you again. Actually, we were missing your creative idea & your sympathy greeting & celebration card card is very beautiful.